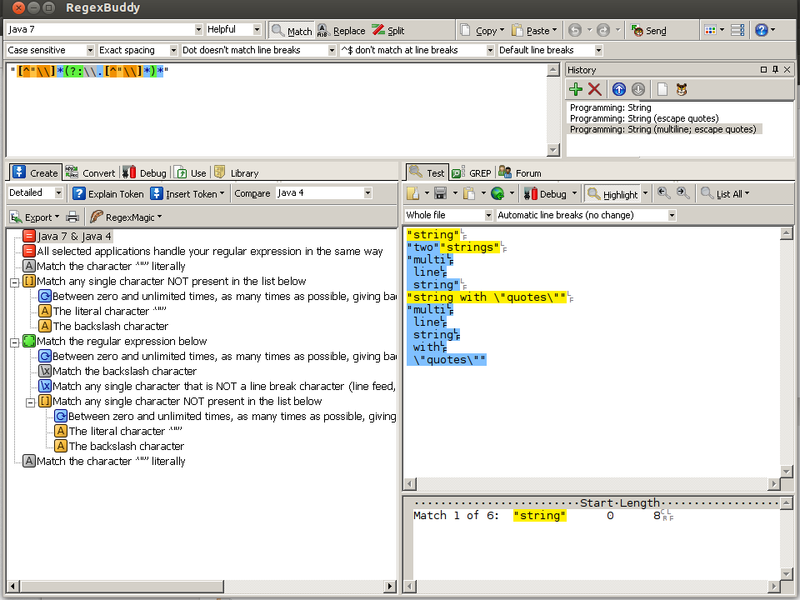 While there is no native Linux version of RegexBuddy, it is possible to run the Windows version of RegexBuddy on Linux using Wine. Wine is an application designed to run Windows applications on Linux. Aside from a few minor glitches, this works just fine. First, Wine needs to be installed on your Linux computer. If it isn't already, check the official Wine documentation to learn how to install Wine. You can download ready-to-install packages of Wine for all the popular Linux distributions. Once Wine is installed, use the web browser on your Linux computer to download RegexBuddy. If your browser asks you if you want to run the file with Wine or to save the file, choose to save it. Open a terminal screen, cd to your download directory, and type: Wine SetupRegexBuddy.exe (change .exe file name to what you actually downloaded). RegexBuddy's installer will pop up. Click the no-questions-asked button for a quick install. To start RegexBuddy, double-click the RegexBuddy icon that the installer placed on your desktop. If there's no desktop shortcut, type Wine "c:\Program Files\Just Great Software\RegexBuddy 4\RegexBuddy4.exe" in a terminal screen (assuming you used the default installation folder). We tested RegexBuddy 4 on an Ubuntu 16.4 x64 installation in VMware. Wine was installed via sudo apt-get install wine. RegexBuddy runs just fine under Wine. The only obvious issue is that RegexBuddy may not pick a suitable default font. This depends on which fonts your Linux system has installed. If text appears incorrectly spaced, click the Preferences button in the top right corner and then click the Configure Text Layouts button. Make sure that all the text layouts you're using have proper fonts. The "monospaced left-to-right" text layout that RegexBuddy uses by default only produces good-looking text when the font is monospaced. Older versions of Wine, such as the one included with Ubuntu 13.10, caused the 64-bit version of RegexBuddy to crash due to bugs in Wine. These appear to be fixed in the version of Wine included with Ubuntu 16.4 as 64-bit RegexBuddy is perfectly stable on it. If you have an older version of Wine, you can run the installer with wine SetupRegexBuddyDemo.exe /32 to force it to install the 32-bit version. RegexBuddy includes a help file in .chm format. Wine can display this help file, but doesn't always. The same text is available as an online user's guide. "RegexBuddy is one of those super time-saving programs, when frankly, you need to show results not labour. I've tried programs like kregexpeditor, visual regexp and kodos, and none of them comes close to the user-friendliness and easy learning curve of RegexBuddy. "Version 3 runs without a glitch on Ubuntu Edgy [using Wine], including copy-and-paste."